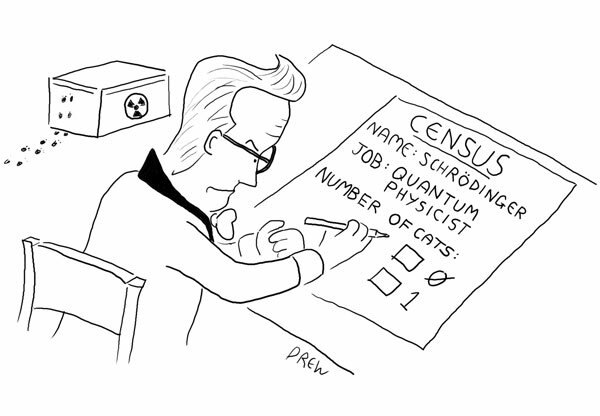 Above is everything you need to know about Schrodinger's Cat in a (cartoon) box. Actually the Wikipedia article is probably more revealing. I did lots of Physics at secondary school and then went on to University where they told you that all that classical Newtonian laws of gravity was okay for kids but there was this bloke called Einstein who had some special relativity and also some more complicated general stuff. Alongside that was Quantum Physics and the famous (thought) experiment Schrodinger's Cat. There's a scientist who puts a cat in a box with a quantum device that has a 50/50 chance of killing the cat. While the cat in is the box he doesn't know if it is dead/alive or in some quantum half-dead/alive state until he looks inside. For a better description read the BBC h2g2 article. The cartoon is for the CCGB's weekly contest. The physicist in me may have clouded my cartoon judgement as I had other possibly funnier ideas but it scored points which is better than last weeks.